Adam Moszynski gets deep. Matt Power photo. After a chance encounter on the steamy dance floor of Aspen’s Club Chelsea brought visiting recent college graduates Adam Moszynski and Darcy Conover together in the fall of 2004, a spark was ignited, and the couple soon moved to Aspen, Colorado to take up ski bumming full time. 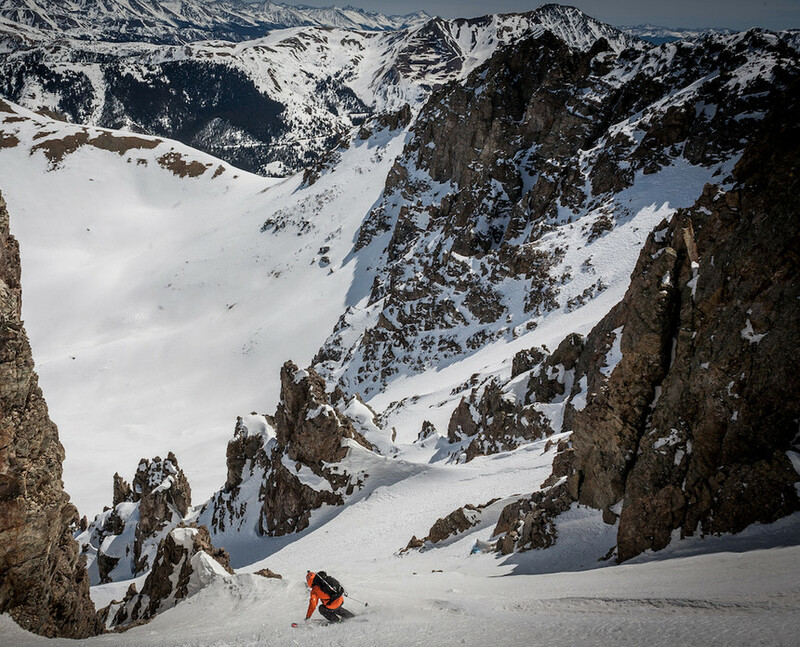 In the years that followed, Moszynski became locally well known for his top-10 finishes on the Freeskiing World Tour, a rare ski descent of Ecuador’s 19,347-foot Mt Cotopaxi, as well as climbing all of Colorado’s 14ers. Conover herself is an accomplished skier, having skied 44 of Colorado’s highest 100 peaks, in addition to exploring many of the state’s lesser endowed but equally daunting mountains. During those early Aspen days, the two were sponsored by several clothing companies and were constantly testing gear, only to find themselves constantly complaining about their base layers. It wasn’t until their honeymoon on Mt. Kilimanjaro in 2012 when they decided to do something about it, and the idea of Corbeaux Clothing was formed with the mission of creating rugged and stylish performance clothing with a focus on social and environmental responsibility. A year after officially launching Corbeaux in 2015, the couple had a baby daughter, adding another significant component to their lives. TGR recently caught up with Moszynski to discuss all things Corbeaux, what it is like to take on two of life’s most daunting challenges at the same time–entrepreneurship and parenthood–while also trying to score as many days on the hill as possible. 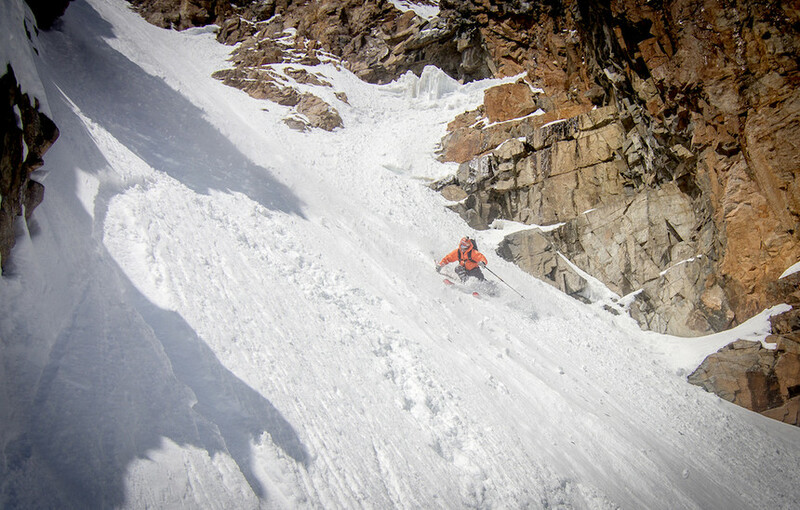 TGR: Tell us about the origins of Corbeaux and what led you to create this company? Adam Moszynski: After being sponsored and testing clothes for a number of years we realized everything was pretty dialed, except for the next-to-skin stuff. Years of endless testing for other companies lead to the formation of Corbeaux. TJ David photo. It was an afterthought to most companies, and if they were a base layer company, they were using wool. Darcy and I can’t wear wool as we get super rashy, so we were looking for alternatives. We figured the fit, the performance, and having these layers look good was something that was never perfected. We wanted to create something you can wear for all sports year round. Something to wear not only skiing, hiking, biking and camping, but also going to the gym doing yoga and for traveling. It’s adventure apparel. TGR: What type of materials do you use in your garments? AM: We wanted to use something environmentally friendly, super comfortable, with fun patterns, a really good fit, and obviously quick-drying and breathable and useable in all sports across the board. We wanted to use an alternative fabric to wool, so we started with bamboo. Bamboo is super soft to the touch, it has the same properties of wool in that it’s hypoallergenic, anti-static, anti-fungal, anti-microbial, and it’s a renewable resource. We also use recycled polyester which helps keep plastic out of the oceans and landfills. We have been able to tighten the weaves on some of our poly fabrics, so it has over 50 UPF sun protection. Ordinarily, if you find that in a poly, it is done via a chemical treatment of the fibers which can either wash out over time or even leak into your pores. This is sun protection naturally. TGR: What does Corbeaux mean and how did you come up with this name? AM: Corbeaux means raven in French. I grew up in France actually. I learned how to read and write in French first, and the significance of the raven in mountaineering lore from Chamonix is that people who passed away in the mountains, their souls come back as ravens to watch over and protect us. Corbeaux uses an unexpected material–bamboo–to craft next level base layers. Noah Powell photo. Over the years, we have all lost too many friends to the mountains, so it was a bit of a nod to them and something that people who live in the mountains can relate to. TGR: Starting a business from scratch can’t be easy. What are the challenges you have had starting up Corbeaux? AM: (Laughs) Lots of challenges. We manufacture all our clothes here in the U.S. While that has advantages of there being no language barriers, no duties or import taxes, it also has challenges. Pricing is a challenge, funding is obviously a big hurdle, and finding people who believed in us. Neither Darcy or I studied economics or business in school. The entrepreneurial couple at the Mount Uhuru base camp. Corbeaux photo. Juggling a company, just the two of us, on a tight budget, and now with a two-year-old, is definitely tricky. It was also a challenge to not pigeon hole our company only in the ski industry. Our big push is that we are a year-round company, especially for people living in mountain towns, we wear base layers and this type of adventure apparel all year round. 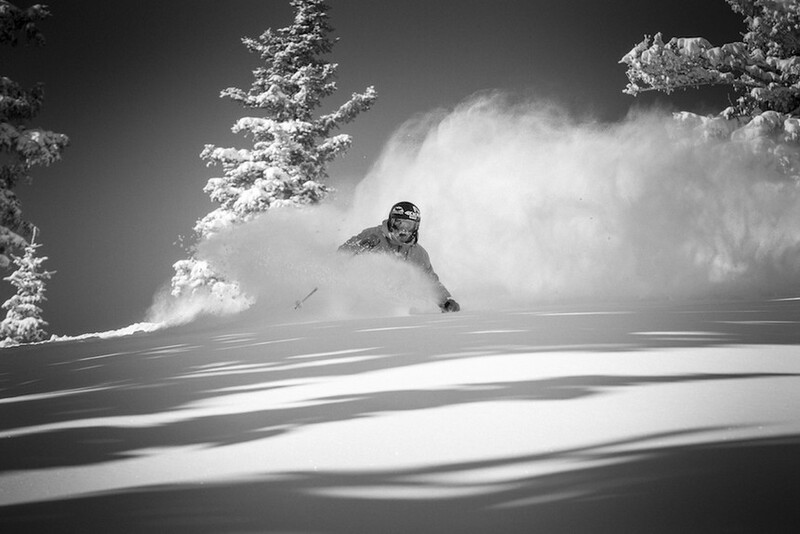 TGR: How has Corbeaux been received within in the ski community? AM: It’s such a great community. So many people have been so helpful, willing to sit down with us, give advice and share their experiences. I am not sure of what other industries there are where people are so willing to share information to help people like us succeed. You share the same passions and know that you’ve had similar experiences to the person you are shaking hands with. You are here for the same reasons. TGR: How are you able to manage the demands of being a business owner, a new parent, and a skier? AM: We have grandparents in the area who are super helpful. I don’t think we could pull anything off without their help. That, and coffee, lots and lots of coffee. Adam on Mount Arkansas. TJ David photo. Darcy and I are still able to ski a couple times a week, sometimes more depending on the conditions or if we have a trip lined up. We don’t ski or adventure as much as we used to, or the days are maybe shorter, but life would be boring if we didn’t have all these things going on. It’s nice to put the pedal to the metal and get the most you can out of life. TGR: What are some of your greatest successes so far with Corbeaux? AM: We never get a unit returned, so we can deduce the quality is good. We have had really good reviews in Outside that have helped a ton, the exposure there is amazing. Our ability to get editorial has been huge. Advertising is not really affordable for the most part, so you have to figure out your marketing strategies other ways. We are also proud of our give-back programs. We have been setting up gear and clothing drives for gear porters in Peru, Ecuador, and Kenya. Overall, we have outfitted close to 100 porters in these countries with lightly used jackets and gear including footwear and backpacks. TGR: What does the future hold for Corbeaux? AM: The recent OR/Snow Show in Denver was great for us. We had tons of foot traffic, got lots of new accounts, new reps in the Midwest—I guess it was what you would hope for. We are also bringing someone on to consult with us for marketing and sales support. We hope to make it to ISPO next year to open up Europe and would love to do business in Japan and Canada. We are going to start working with evo and Amazon and that should help us with our online presence. Corbeaux is currently sold in eight states so growing that would be a big goal, as well as a little more expansion here at home in Colorado on the Front Range. We want broader distribution, a little bit of growth and online presence, and everything done in a sustainable manner to suit our two-man team.